This could be the start of something bigger than IU's beloved commit. The Hoosiers drew 0-0 with the Mexico U-20 National Team on Sunday afternoon. A late comeback pushed Theta to its third win in four years. The Little 500 will commence Friday and Saturday. "Breaking Away" is a beautiful movie and should be treated as such. Both goals for the Hoosiers and Billikens came in the second half of play. IU didn't look like the team we've grown accustom to. IU has been a two-sided coin throughout the regular season. The Hoosiers have to fix their issues quickly before the Big Ten Tournament. Johnson showed why he's so valuable Saturday afternoon. It was an important win for IU, but it didn't feel like it. It's easy to see why Miller is a perfect match for IU. IU's recruiting class was ranked eighth in the nation by Top Drawer Soccer. Newkirk's benching has been long overdue. IU brought everything but shooting against Michigan State. It was an ugly finish the last time these two teams met. Two games in three days is a recipe for disaster. IU didn't execute late against Purdue, making just one basket in the final four minutes. 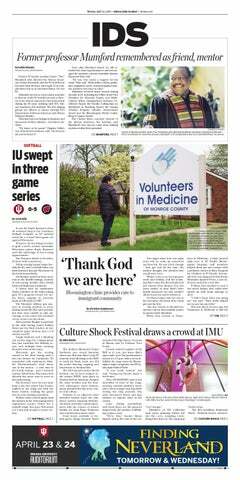 IU shied away from its most consistent play, and it came back to bite them in the end. IU scored just seven points in less than five minutes without Morgan on the court.